On July 4th, Saturday night, the curtains came down upon the NABC 2009 at the San Jose McEnery Convention Center. But as the NABC lights faded out in the West Coast, Kallol of New Jersey got into full gear to herald in the NABC of 2010 to be held at the Atlantic City Convention center from July 9th to 11th, 2010. Although I was not able to attend the San Jose NABC, but judging from the excellent coverage on Urhalpool, it seemed that it was a successful one from an overall perspective. It seemed that the shows ran on time (which was unthinkable even a few years ago, NABC seems to have fixed that vexing problem and made this cartoon irrelevant), they were entertaining and dazzling, food was good, as were the long adda sessions. The second generation kids also seemed to have enjoyed themselves, some made new friends and some met old ones they met at previous NABCs. 1. Cut down the number of artistes from India (Kolkata, Mumbai). Inviting a large number of artistes and performers from India is counter productive. It not only boosts the NABC budget, but to the audience members it becomes a major hassle to co-ordinate between other shows, social meetings, literary seminars, films, theater etc. etc. I have nothing against the professional performers from India. My point is to give some room to the audience members to enjoy and appreciate the other programs. How can we expect audience at a literary seminar when it runs parallel to “Shan”, “Shreya” or “Srikanto”? And hence during the local performances, they take their breaks for meals, addas and shopping. Please give them a break. 2. Introduce new and upcoming talents from India. Aren’t we tired of watching and listening to the same performers again and again? Srikanto Acharya is a great singer, but think how many times we have heard him in the last five years. We wouldn’t have attended his concert this many times even if we had lived in Kolkata. Same goes for many of the other artistes whom we see at each and every NABC gathering. Why not introduce some of the new and upcoming artistes at NABC? With the proliferation of Indian and Bengali TV channels in USA, we are now familiar with many of these artists. One name comes to my mind is “Sahaj Maa” – her renderings of Sufi and folk music is simply mind boggling. Stand up comedians like “Mir” or “Kanchan” can be an excellent addition to the usual repertoire and they can double up as anchors/emcees. 3. Special events for second generation. Although this sounds like a cliché, but the fact remains that we mostly ignore our next generation at the NABC festivities and get too involved with ourselves. Mind you, when we talk about second generation, we are talking about a wide range of age groups. “Speed Dating” (introduced at NABC 2009 I presume) is nice for the youths, but may not be that attractive for the younger kids. We need to be innovative about getting them engaged – be it quiz contests or spelling bees, Bengali Idol (NABC idol was introduced in 2009) music contest, children’s drama competition, dance competition – anything that can engage them. How about mini-workshops on arts and crafts, music, acting or film making? And let our second generation kids organize, manage and run them. I have more wishes and I’ll list them in the coming weeks. I also welcome comments and suggestions from the readers and listen to their wishlist. However, the bottom line is that we need to rethink the objectives of Bango-Sammelon aka NABC and act accordingly. 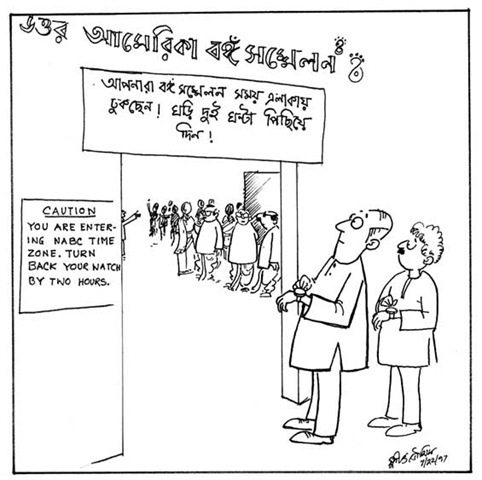 This entry was posted in Arts-Culture, Generic and tagged bengali culture, bengali literature, frustrations, generation kids, grievances, home turf, jose mcenery convention center, Kallol, Kolkata, major component, mcenery convention center, NABC, registrants, san jose mcenery, san jose mcenery convention center, second generation, shan, shantanu, sunil, vexing problem by sudipta. Bookmark the permalink. 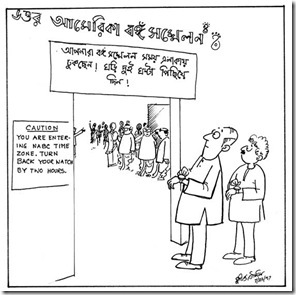 “NABC seems to have fixed that vexing problem and made this cartoon irrelevant”. Well, it may seem irrelevant at this point, but I wouldn’t rush to make such statement since Kallol will be hosting NABC2010. Who knows it may be more relevant. However, I would like to add that NABC2010 organising committee should only invite new comers and not the old “hyped” performers like Srikanto Acharya, Indranil etc. 2. I also agree with your other points of engaging younger generation with innovative activities (not the speed dating). 3. However, I have little different view points of giving more coverage to litterary activities like recitation, seminars etc. I don’t necessarily agree. Unfortunately, the reality nowadays among the NABC organisers are somewhat like Durga Puja’s in Calcutta. Who can spent more money and bring all the the latest performers from Bombay. The focus is more on the bells and whistles and it should be that way. Without that no one will come. So, whether we like it or not, this is the reality. I think it would be better and will serve both the purpose to have more visual actitivities like Drama (good bengali drama), Old movies, Dance Drama of Rabindra Nath Tagore performed by celebrities etc. You are very right. But are these voices reaching the coordinators? Get involved! Represent your regional Bengali community! Come to NABC 2010! I enjoy attending NABC conference. The organizers put lot of hard work and sacrifice but it is always well done and enjoyable to the attendees. I am looking forward to attend it in July at Atlantic City,NJ.